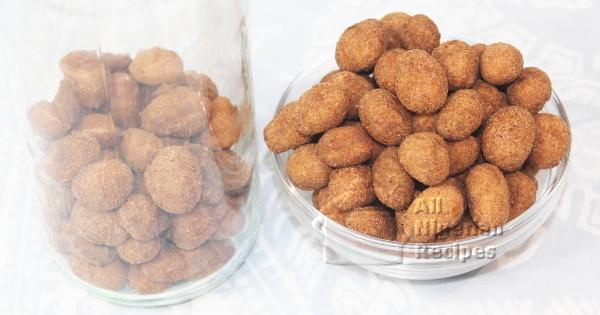 Coated Peanuts also known in Nigeria as Peanut Burger is popular with those who have tasted the tinned version of this snack. Here is how to make yours at home. For Coated Peanuts (Peanut Burger) that taste as close to the Koh Kae® brand of coated peanuts, you will need the following ingredients. Use roasted peanuts that are still stuck together. Do not use broken ones. I love my coated peanuts spicy that's why I added dry cayenne pepper, if you do not want yours spicy, leave it out. You can buy cinnamon from big supermarkets or bakery shops in Nigeria. If you cannot find it, use nutmeg but cinnamon is tastier. You can also make coconut flavour of this snack. Mix all the dry ingredients together. Sift with a sieve. Whisk the egg very well until foamy. Add 1 heaped tablespoon of the mixed dry ingredients to the egg and whisk again till you have a smooth light batter. See the video below. 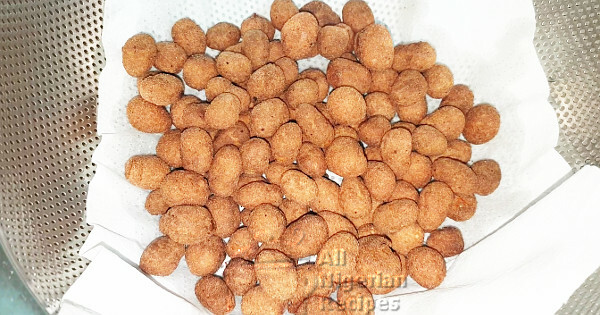 Put the roated peanuts/groundnuts in another bowl, scopp a small quantity of the egg batter into the peanuts. Shake the contents in a circular motion. Watch the video below. Add the dry ingredients mixture, shake in a circular motion till the peanuts are coated with the dry ingredients. Keep adding these two ingredients alternately till all ingredients have been used up. Deep fry in the oil. It is best to watch the video below for a visual understanding of the recipe. Enjoy coated peanuts with a chilled drink.